LITTLE at LARGE is a residence in the Clare Valley set on an open bush site. It is a family house that responds to the poetry of it’s big setting. The house negotiates a balance between architectural fineness and country pragmatism - pragmatism demanded by a constrained budget and family life on a tough rural site. The result is a refined building, a house with honest country character. The site is vast. We responded by giving the little house a large presence. The roof and house stretch along the contours, and playfully respond to the dynamism of the bush and valley they meet to the west. Our brief for the house was to design an innovative, environmentally sustainable family home that could cherish its natural setting as much as our clients did. We allowed the roof to be a key design element – it’s form references the undulating hills while harvesting all rainwater in one single gutter for re-use as the family’s sole source of water. It extends past the house in all directions, providing shelter and hovering over the landscape. The roof is confident under the blazing outback sky. The house separates into two wings - one for living and one for sleeping. The open living space welcomes the site on 3 sides, while behind the rammed earth spine wall, the sleeping spaces occupy the cool side of the house, with framed bush views to the south and night skies filled with stars to the horizon. Materials have been used to link the house to place and program. The house is anchored to the ground by a charcoal coloured concrete slab and a long rammed earth spine wall between the 2 timber wings. Functional contrasts reverberate through the Silvertop Ash cladding, with one rough sawn – left unfinished to silver off and the other fine sawn and oiled to retain richness of the heart timber. 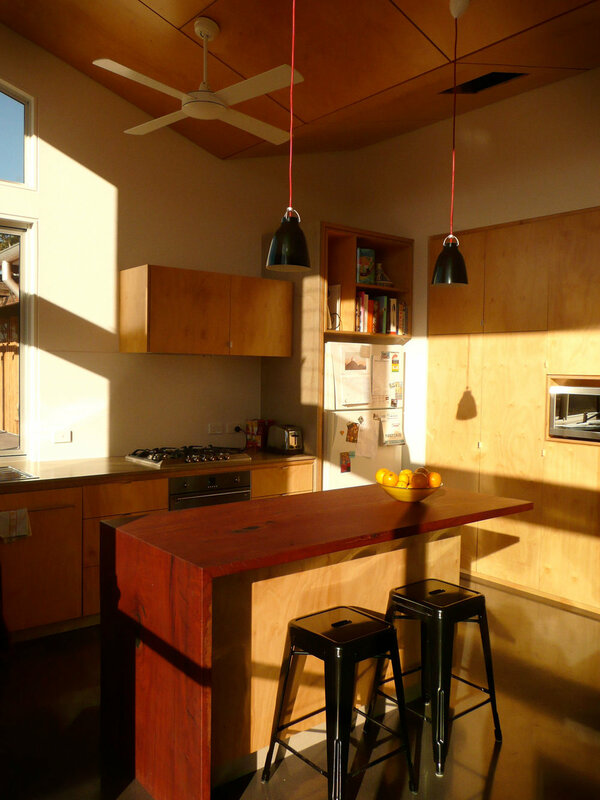 As a counterpoint to the dark floors, timber and rammed earth give warmth to the interior. The house is designed to passively heat and cool, using orientation, thermal mass, hydronic in-slab heating, double glazing, large eaves and verandahs to block summer sun, provision to grow vines on cables for summer shading, strategically placed openings for cross ventilation and summer breeze capture, high levels of insulation, water harvesting and an on-site reed bed waste treatment system. 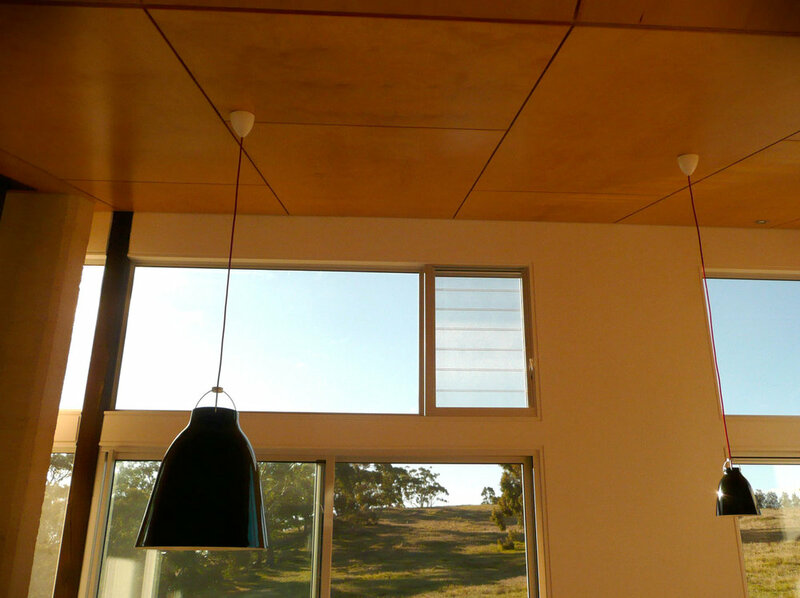 It is clad with radial sawn Silvertop Ash and uses recycled Jarrah salvaged in South Australia. The Clare Valley residence has provided our clients with everything in their brief within a modest budget. It sits confidently in it’s setting allowing our clients to be immersed comfortably in the Australian Bush.